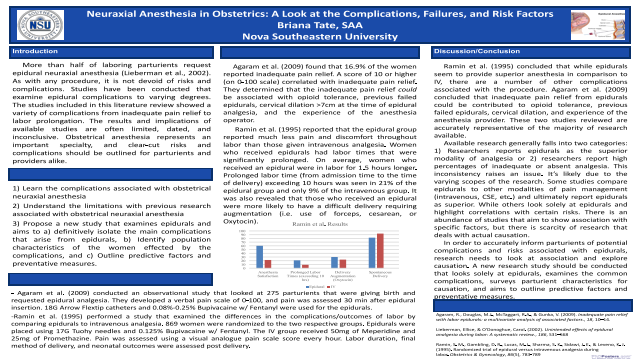 Abstract: More than half of laboring parturients request epidural neuraxial anesthesia (Lieberman et al., 2002). As with any procedure, it is not devoid of risks and complications. Studies have been conducted that examine epidural complications to varying degrees. The studies included in this literature review showed a variety of complications from inadequate pain relief to labor prolongation. The results and implications of available studies are often limited, dated, and inconclusive. Obstetrical anesthesia represents an important specialty, and clear-cut risks and complications should be outlined for parturients and providers alike.